While investigating new solutions I was spinning up POC’s and decided that instead of either making a new jumphost every time or adding manually the access to my existing jumphost I just wanted the new VPC to come up with my minimum set of requirements. One of these requirements was peering the new VPC to an existing VPC with some services I wanted to re-use. To test out various options for automation without impacting existing services I am leveraging a sandbox account which allows me to test out my code without a concern of impacting existing customer accounts. 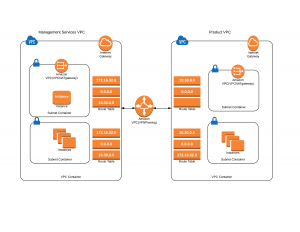 If a new VPC is created in a region, it needs to be peered with an existing Management Services VPC. The route tables of both VPC’s must be updated to direct relevant traffic between the VPC’s. For this to work, the VPC’s that are to be peered with the Management Services VPC must not have overlapping address ranges with either the Management Services VPC or any of the other VPC’s the Management Services VPC is peered to. Is there an example I can just use? I started by looking for examples of how to do this and although there is a nice AWS documentation example to enable peering between 2 different AWS accounts using Lambda, the peering between 2 VPC’s in the same account did not have an example. I used this guide http://2ndwatch.com/blog/vpc-peering-via-cloudformation/ to work out what I needed to do and expanded it for my needs. I have a CloudFormation template file that builds up my standard VPC with a public and private subnet and a NAT gateway for outbound traffic. As my Management Services VPC already exists and has some services I want to use (such as a jumphost) then I want to peer my new VPC to that existing management services VPC. This is an overview of the 2 VPC’s that I will be connecting. The Management Services VPC already exists and the Product VPC is the one I am creating as “Standard VPC”. The existing Management/Services VPC will be referenced in the new template by using parameters. At first this errored for me as I was referencing the route table as Type “Route”, but that is not allowed as a parameter type. To reference a route table from another stack I used the type of “String” and entered them in the template directly. I later replaced the Default Values as I wanted to anonymise the template so that it could be shared. You will need to either have these values as outputs from your previous service VPC creation (in which case they are referenced differently) or look up the values and input them here as the “Default” or on creation of the stack. This is the new VPC I am creating which I want to be peered with my Management Services VPC so that I can use my jumphost and any other services I may need, such as LDAP, monitoring etc. I will specify several resources to create here, they will define entries to my routing tables in both VPCs. The account creating the VPC – which is making the peering request – must have sufficient permission to both create the request and approve it. I’m doing this in my sandbox account where I am for all intents and purposes all-powerful :-). If you are not using your own permissions to do this you will have to run this update as a user who has this level of access or allow a role to be assumed that gives the same access. You can see from the code blocks that I need to let my new VPC know which requests to IP’s need to go via the Peering connection. The peering request itself is quite straightforward and just references both VPC’s. Now when the VPC is created, the peering request is also created and approved. The relevant routes are added to the routing tables of the management/services VPC and the new VPC. I have parameterized the values for the VPC CIDR as well as the Public and Private Subnets and the AZ so that they can be modified for each new VPC. Again you could add multiple AZ’s here – I just wanted to keep it straightforward. Now when I use the template to create a new VPC it creates the peering connection as it comes up and I can connect directly from my jumphost in the Management Services VPC to the host(s) in the Product VPC. Is there a way I can just grab a CloudFormation template that includes these samples? Use git to clone the repo or download the file as a zip. I hope you will find this template useful and let me know what you think in the comments box below. Next time I will focus on stacking templates. If you want to be notified, just sign up to the blog to get all new posts sent straight to your inbox! 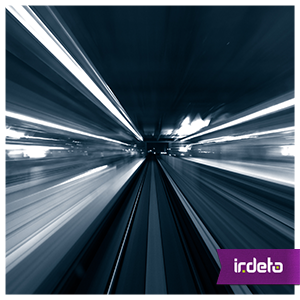 Note: Irdeto provides a range of software security products and services based off of our Cloakware Software Protection suite of tools and technologies. All of the solutions, including Cloakware’s Secure Environment, adopt a multi-layered, self-protecting, approach to software security. This entry was posted in Practical Guides and tagged AWS, HowTo. Bookmark the permalink.